Bhopal, January 31, 2016 (Abdul Ahad Farhan): Work to asphalt road from Lily Talkies upto Depot crossing and improve and widen road from Police Control to Jail Road and MP Nagar got underway today. 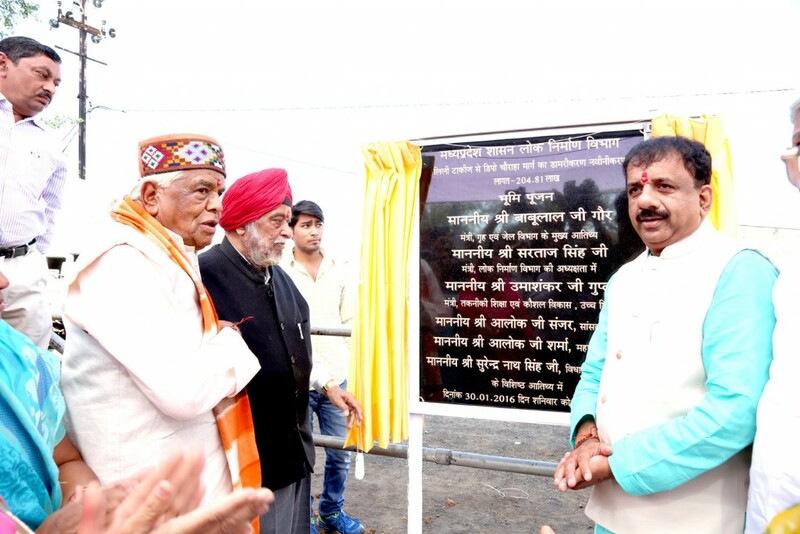 Home and Jails Minister Mr. Babulal Gaur and PWD Minister Mr. Sartaj Singh performed Bhumi Poojan for this work. Mayor Mr. Alok Sharma, MLA Mr. Surendranath Singh, Ward President Mrs. Saroj Jain and local Corporator Mrs. Meena Yadav were also present at the meeting. Mr. Gaur said that officers and construction agencies should ensure road construction and asphaltation with quality within time-limit. He said that these are busiest roads connecting old and new cities. Cost of asphaltation and improvement of road from Lily Talkies upto Depot crossing is about Rs. 2 crore 5 lakh. The 3.75 km long road will be completed in 6 months. Length of road from Police Control to Jail Road and MP Nagar is 2.5 kms. It would be developed and widened at police control room, old jail crossing, Paryawas Bhavan crossing and petrol pump and Haat Bazaar crossing. The road costing Rs. 6 crore 61 lakh would be completed in one year.